A node separator of a graph is a subset S of the nodes such that removing S and its incident edges divides the graph into two disconnected components of about equal size. In this work, we introduce novel algorithms to find small node separators in large graphs. With focus on solution quality, we introduce novel flow-based local search algorithms which are integrated in a multilevel framework. In addition, we transfer techniques successfully used in the graph partitioning field. This includes the usage of edge ratings tailored to our problem to guide the graph coarsening algorithm as well as highly localized local search and iterated multilevel cycles to improve solution quality even further. 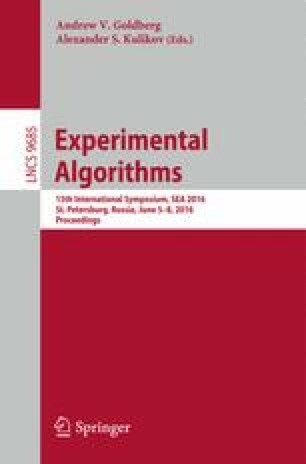 Experiments indicate that flow-based local search algorithms on its own in a multilevel framework are already highly competitive in terms of separator quality. Adding additional local search algorithms further improves solution quality. Our strongest configuration almost always outperforms competing systems while on average computing 10 % and 62 % smaller separators than Metis and Scotch, respectively. This paper is a short version of the TR . Basic properties of the instances used for evaluation.